Astigmatism, which can occur with myopia or hyperopia, is a condition in which the light entering the eye is not refracted (or bent) equally in all directions. Due to differences in the curvature of the eye, the light has two focal points often causing blurred near and distance vision. Biotrue® ONEday for Astigmatism daily disposable contact lenses have more moisture than any other contact lens and maintain nearly 100% of its moisture for a full 16 hours. • With stable High Definition Optics, the Biotrue® ONEday for Astigmatism contact lenses help reduce halos and glare in low light situations. 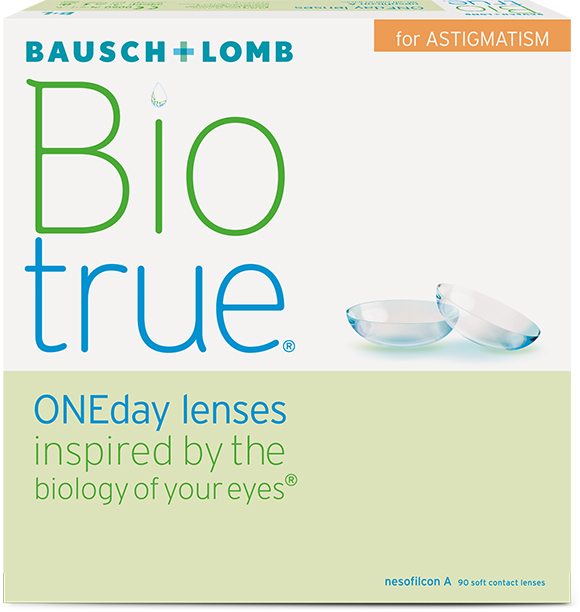 Experience Biotrue® ONEday for Astigmatism daily disposable contact lenses for consistently clear vision and comfort throughout the day.